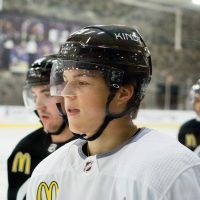 In reality, Marcel played for the Kings from 1975 to 1987. When he netted goal #700 in 1987, he became just the third player in history to reach the milestone. Nearly all of those came with the Kings (550). Dionne is in the top 10 of almost every major offensive category for the Kings and he took his rightful place in the Hockey Hall of Fame after retirement. June 10, 1971 – you’re selected second overall at the NHL Entry Draft. However, you were almost taken first. What do you recall about that whole experience? I wasn’t even planning on going to the draft. The owner of St. Catharines (junior hockey, Quebec league) told me I should go, so I did. It just wasn’t a big deal back then. The draft is totally different now. Anyway, Montreal traded for the #1 pick and they were going to take either me or Guy Lafleur. They wanted us both though. They tried to trade with Detroit for the second pick too, so they could have us both. The Red Wings said no and the drafted me, right after Montreal took Guy. June 23, 1975 – your rights are traded from Detroit to Los Angeles. On some level, leaving the Red Wings had to be difficult. Was it really all about the money and who was your biggest supporter at the time, helping you deal with the mental part of leaving the team that drafted you? Money was the key. If the WHA hadn’t come along, it probably wouldn’t have happened. Not that I went to the WHA, but that league was creating a different dynamic for players at the time. Mickey Redmond told me ‘You have one shot at it.’ They offered me $175k for the next five years and they told me I could call around and see if I could get more. When I found out LA would pay me almost double I never went back to Detroit and tried to get them to match it. Also, Lafleur was given a three year deal and then his second contract was for 10 years. I was given a one year deal and then a three year deal by Detroit. That just didn’t seem right to me, so I was looking at my options. 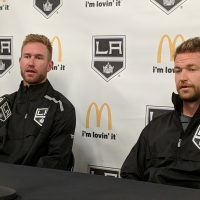 Given some of the talent the Kings had back then, in your opinion, why wasn’t the team more successful? For starters there wasn’t a lot of cohesion. They never kept their draft picks. You need to be competitive first, then you have a chance of being successful. Jack Kent Cooke was a real demanding owner. But you can’t keep changing your general managers and coaches. In the meantime, players come and go. In my career, I played for 18 coaches in 18 seasons. 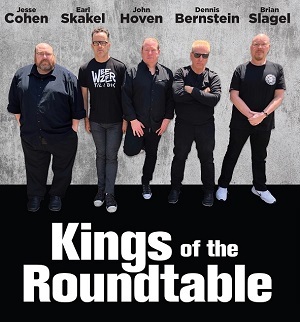 Not all with the Kings, but still. That’s a lot of changes for a guy to endure. We just did it though. You didn’t talk to management back then and tell them how to do things. Well, some guys might have. But, the players were the players and you let managers do their job. I tell my employees the same thing. You’ve also said in other interviews the one missing piece for the Kings in the ’80s was a puck moving defenseman. 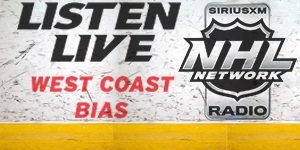 Given all the changes in the game, do you still feel a puck moving defenseman is as critical today? Start with a goalie. If you don’t have a goalie, you can’t win. You need one defenseman, one center and one winger. Build a team around that. There aren’t many defenseman today that can control the game, like (Denis) Potvin or (Larry) Robinson did back when I played. Teams play a different system today. Guys don’t jump in like Paul Coffey used to. March 10, 1987 – you’re traded to the New York Rangers. How did you feel then versus maybe how you see things with the benefit of hindsight? I didn’t want to go. If I had to leave, Quebec or Chicago would have been better – a place where I could have been the 2nd or 3rd line center. Rogie (Vachon) was friends with the GM in New York (Phil Esposito), so I think that’s probably why I ended up there. The Rangers had too many problems though. I knew from the moment I got there I was in trouble. However, the travel was incredible. Everything was so different, we were there and back so fast when we went out on the road. You got to see a young Tomas Sandstrom when you arrived in New York. He later ended up in LA and I would say he is one of those underrated players from the generation after you. Do you have any early memories of him breaking in with the Rangers? He wasn’t the perfect guy for me to play with…like Dave Taylor. We were a give and go line. Sandstrom was a tall guy, a big player…and he would hold onto the puck. But I liked him very much. He was a tough Swede. It was just hard for me to figure out what he was going to do because he would hold it. Ovechkin likes to touch it, not hold it. I told (Anze) Kopitar ‘You aren’t touching the puck enough. 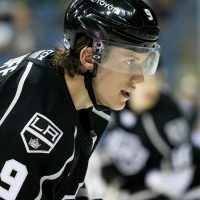 I don’t like your breakout.’ I think Kopitar can make magic with the puck. And having play with Ryan Smyth is great. He reminds of Glen Anderson (Oilers). 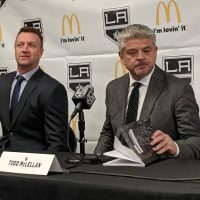 Around the time you left Los Angeles Bruce McNall was buying into the team…and eventually took full control soon after you left to New York. How do you think the end of your career might have been different had Bruce come on board a few years earlier? He would have changed things somehow I’m sure. In 1981 I played with Wayne for Team Canada and I was just amazed at how many times he touched the puck. I still had some gas in the tank when I left LA too. I scored 22 power play goals the next year with the Rangers even though some nights I was only getting five minutes of ice time. It would have been exciting to play more with guys like Jimmy Carson. It would have been very interesting. November 8, 1990 – your jersey is retired by the Kings. To fans in Los Angeles you’ll always be #16. However, when your career first started in Detroit you actually wore #5 and #12. How did you eventually end up with the more famous number? I was just issued #5 when I first joined the Red Wings. Then, in my fourth year there, Alex Delvecchio told the coach that five was a number for a defenseman. The coach agreed and gave me #12. Then, when I arrived in LA Jack Kent Cooke said he wanted to give me #9, but Bob Nevin was already using it. So, I ended up with #16. The arena is Drummondville (junior hockey, QMJHL) was renamed after you. How weird is it to have a building named in your honor? The first few times I went there it was weird. My kids used to want to play there. It must be like Tim Horton going to Tim Horton’s Donuts. It’s just a little strange. However, it’s a great honor and I’m very proud. It wasn’t something I ever thought about growing up playing hockey. It doesn’t work like that. It can’t just be the three best players in the league or on a team. Me, Davey and Charlie had a special chemistry. Once Charlie left, we were never the same. Malkin – Crosby – Ovechkin wouldn’t work as a line. Ottawa might have had one of the last great lines in recent hockey memory. But, if I had to pick one player and try to build a line around him, I might start with Rick Nash. He is as good as anybody in the league. After retirement you went into the dry cleaning business and then plumbing. Why did you stay away from the game – why not coach or go into TV? I knew too much. I also didn’t like a lot of the people I worked for. I like people. Players got screwed by managers or GMs that didn’t like them. The league was full of personal problems. Guys didn’t do research on the other players. So, I wanted to do things on my own and I also wanted to do something different. I wanted to be my own man. The situation going on with the Player’s Association is a perfect example of the type of problems I’m talking about. There is no trust. It’s a screw me, screw you environment. You’re obviously still passionate about the game though. So, if you were the Commissioner for a day, what change would you like to make? That’s simple, slow the game down. Everybody wants the game to be played at a faster pace, but they’ve hurt the game – both in the amateurs and the pros. You can’t slow down people. Yes, there was too much interference before. But now, when guys hit, it’s at full speed. Removing the red line is full speed and that’s too fast. It’s almost like football out there now. Incidents like what happened last year with the Kitchener Rangers are terrible. It was a bad hit and that kid will never play again. The other guy got a suspension, but it’s a reaction. You think he was thinking about hurting him? I don’t. Death row doesn’t stop murder. Part of the problem is players don’t protect themselves. Slow it down and protect them. There are so many more stories to cover with Dionne – like the death threat he received the night the Kings were in Pittsburgh, the Miracle on Manchester, mentoring a young Luc Robitaille and so many more – you just never have enough time when you’re speaking with such a legend. 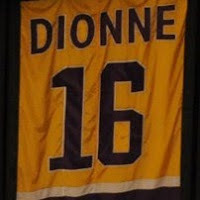 For more with Dionne and other articles on Kings history be sure to see the links below.